The Institut français d’archéologie orientale and Polish Centre of Mediterranean Archaeology Research Center in Cairo are organizing an international conference on food and drink in Egypt and Sudan throughout history, focusing on the continuity and innovations that have occurred at times of change. Whether political, religious, cultural or environmental, drastic transformations have often left their mark on food. They affected available ingredients, how they were prepared and consumed, and even people’s attitude towards certain items. 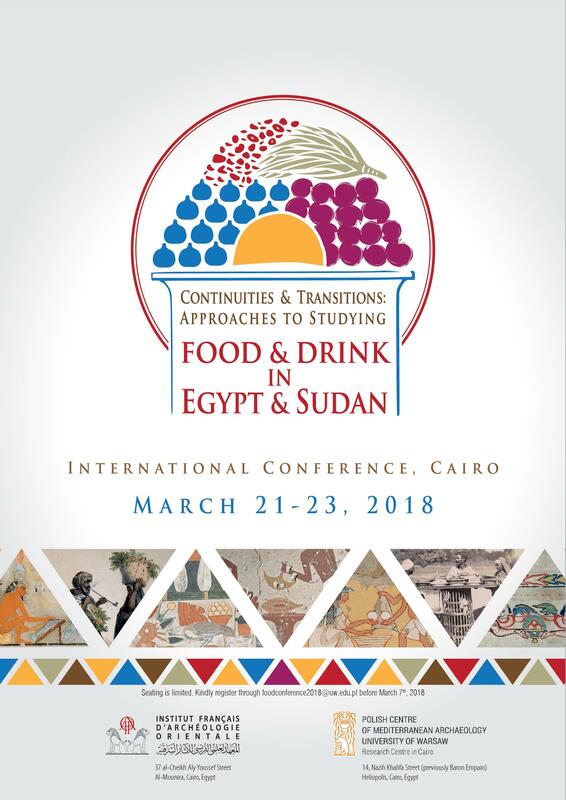 The conference will aim to question notions of continuity in both Egyptian and Sudanese cuisines, focusing on shifts observed in food and drink as a result of times of transitioning. Presented papers will not only cover a wide geographical and temporal range, but are interdisciplinary, highlighting the diverse methodologies and datasets that can be used to study food and drinkways. By including both Egypt and Sudan together, the meeting will allow scholars to reflect on (dis)similarities on continuities and traditions between these neighbouring countries. See FB event for latest updates. On the margin of the conference, Professor Salima Ikram, Distinguished Professor of Egyptology at the American University in Cairo, will be giving a public lecture on the subject of “Feasts Fit for Pharaohs: Food and Drink in Ancient Egypt” at the IFAO, Wednesday, 21st March, 2018 at 6 p.m.
Agata BEBEL and Anna WODZIŃSKA: Reconstruction of Baking Process Based on Depictions in the Old Kingdom Tombs. Almoatz-bellah ELSAID, Nessrin KHARBOUSH: A Historical and Scientific Study for Pottery Jar of Tutankhamun Collection Used to Preserve Lentil Seeds. Friederike JUNGE: Grieve and Eat – Supply for the Dead and the Living at the Early Dynastic Cemetery of Helwan. Gillian PYKE: Food Management at a Monastic Household in the Wadi al-Natrun: The Ceramic Evidence. Joanna DĘBOWSKA-LUDWIN: Food and drinks in the Early Egyptian Funeral tradition – the Case of Tell el-Farkha. Johanna SIGL and Claire MALLESON: Fish and Fodder: the Alternative Food Supply Chain Found on Elephantine Island. Julie MARCHAND: Cooking & Drinking in Egypt during Early Medieval Centuries: a Time of Changes on the Table & in the Kitchen. Nadia SHOHOUMI: Food and Ritual. An Anthropological Perspective. Nicolas MORAND, Sébastien LEPETZ, Benoît CLAVEL: Meat and Fish Consumption in Ptolemaic Alexandria: Zooarchaeological Evidence from Necropolis and Settlements. Omar FODA: Star of the Nile: How Stella Became the Beer of Egypt, 1882–1980. Paulina LEWICKA: Food and Therapy. Aspects of Medical Discourse of Egypt of the Mamluk Period (13th–16th centuries). Philippa RYAN: Cultivating Nile Islands: Agriculture and Land-use at New Kingdom Amara West (1300–1070 BC) and perspectives from present-day Ernetta Island. Richard REDDING and Claire MALLESON: The Big Question: How Were the Pyramids Built? The Answer: By Well Fed People…! Rim SALEH: Cooking and Storing Food Among the «Commoners» in Graeco-Roman Egypt. Salima IKRAM: Feasts Fit for Pharaohs: Food and Drink in Ancient Egypt (Evening Public Lecture). Shahira MEHREZ: Culinary Infrastructure and Traditions in Early 20th Century Cairo Mansions: In Addendum, a List of Some of “the Lost Recipes of the Notables of Egypt”. Stephen BUCKLEY, Joann FLETCHER, Cynthianne SPITERI, Philipp STOCKHAMMER: Ancient Diets in Egypt and Sudan: a Direct Biochemical Approach. Stephen J. DAVIS: The Politics and Local Practice of Food Distribution at the Shenoutean Women’s Monastery at Atripe: Textual and Archaeological Evidence from the Fifth to the Early Seventh Century. Stephen WOOTEN: The Development of an Agrarian Foodway on the West African Savanna: A Comparative Perspective on Egyptian and Sudanese Culinary Dynamics. Tamar CHEISHVILI, Ketevan GARDAPKHADZE: African Origin Culinary Terms according to De Re Coquinari.